South West is Set to Lead in Solar Power. The South West is set to lead the way in solar power with applications in the pipeline for solar parks to produce up to 750MW. Planning applications for two parks, with 2.2MW and 1.5MW peak capacity respectively, were submitted to Cornwall County Council last month. The council has also met 30 companies to discuss the parks and anticipates receiving 50 to 100 planning applications. Cornwall’s natural resources planning team manager Adrian Lea believes that, as well as the feed-in tariff, the increase in applications for solar parks has been driven by the European Commission’s global irradiation report. It revealed that south-west England has the highest levels of irradiation in the UK. 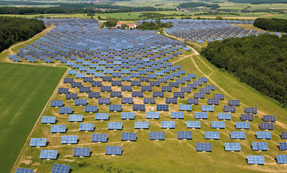 If all the proposed developments occur, Cornwall could eventually have 750MW solar photovoltaic capacity. The UK had just 32MW in 2009. Planning consultant Tom Sylger Jones represents Cornwall Power, which is a group of local farmers and landowners hoping to develop a solar park and benefit from the current low carbon agenda. He said the main impediments to development are visual impact and the reduction of land used for farming. This entry was posted on August 17, 2010 at 10:03 am and is filed under Environment. You can follow any responses to this entry through the RSS 2.0 feed. You can leave a response, or trackback from your own site.